I know it’s all-American and what not, but it’s a struggle for me to like potato salad. Not the mayo-y ones and definitely not the vinegary German style ones (sorry Grandma). The hubs feels the same. 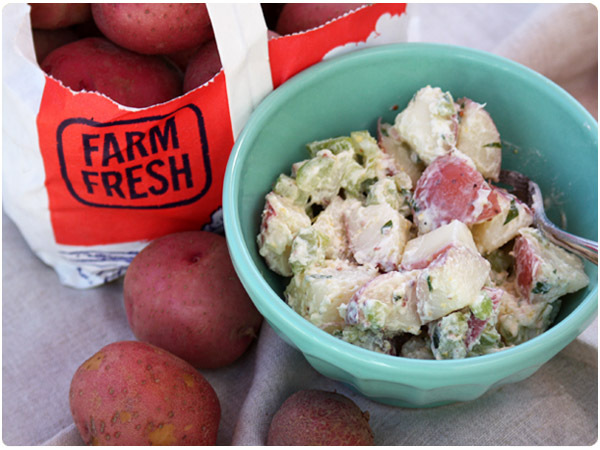 But we had been getting sick of the same old side dishes and while flipping through my recipe binder I found this goat cheese based potato salad recipe that I had pulled from a Martha Stewart Living awhile ago. While potato salad and I aren’t really friends, goat cheese and I are pretty much BFFs. Could goat cheese be the magic ingredient that would convert us into fans of this classic summer side? Indeed it could! It delivers the creaminess of mayo without the uber-richness plus a slight tang. With plenty of potatoes at the farmer’s market these days, this recipe is one I’ll be keeping in rotation. Chop potatoes into bite sized chunks and place in a large sauce pan or stockpot. Cover with water and bring to a boil. Reduce heat to a simmer and cook until potatoes are tender but slightly al dente. Reserve 1 Tbsp of cooking liquid. Drain remaining water from potatoes. Transfer potatoes into a large bowl. Add celery and shallot and toss gently to combine. In a small bowl, whisk together olive oil, mustard, vinegar and reserved cooking liquid. Pour oil mixture evenly over potatoes. Gently mix in goat cheese until it becomes creamy and evenly disbursed over potatoes. Mix in chopped parsley and season with salt and pepper to balance out flavors. 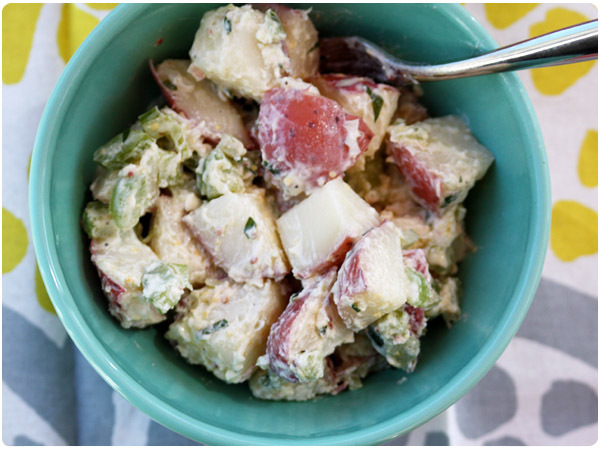 I’m with you, I don’t love potato salad, but I do love goat cheese so this is a potato salad I’m willing to try! I’m hooked on the new Kirkland Signature (Costco) goat cheese – it’s delicious and an incredible value!